Mountain bike planning session and drinks! TOPIC:	Mountain bike planning session and drinks! Well that was a great afternoon playing in the woods and then eating tapas! 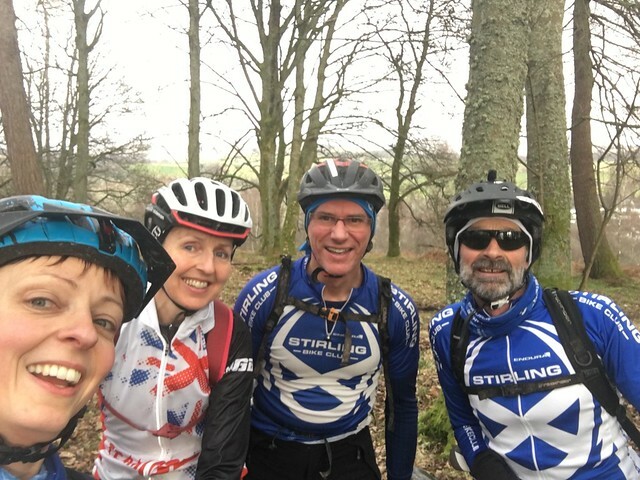 Happy mountain bikers in Park of Keir. I've sent an email round to everyone who I was originally emailing about this with the notes of ideas that we came up with. If you're interested PM me and I'll send them on. More public detail of exciting developments to MTBing in the club soon! We have also set up a WhatsApp group to organise rides prior to posting them here - again, PM me your mobile number if you want to be added. I'm now unable to make the meeting. Will there be notes/minutes from it that can be shared and fed into? I've also provided ramblings a few weeks ago but I'd like to find out more and feed into the development and improvement plan. Haha...so you don't think you'll be done in time for the quiz? I'll see if I can sort out child-minding and be there for 6 - but I'm unlikely to be eating, but I'm keen to input and hear other ideas and suggestions. Richard, I'd imagine that the chat will be ongoing during the meal but get more productive once people have eaten, so the sooner you come the better, but I'd guess we'll have eaten by 7.15-7.30pm. Don't leave it too late as the drinking will have taken over and who knows where that'll lead (joking!). Ok folks, I have booked a table at the Crook for 6pm (didn't want to make it later as they have a quiz night starting at 7!). Some of us are meeting at 3.30 on the bridge for a ride first. I can make the 12th but unlikely to make the ride.....I must have missed that bit!! I will confirm nearer time, but like Richard, keen to come along for the chat and encourage more MTB activity when it is all around us! I'll try and make it along after the meal - any idea when the chat will start? I'm needing to try and arrange childminding, but I'm thinking this meeting is going to be the start of something good so I'd like to be there to throw some ideas in for discussion. I can't make the ride or the meal, but I'd like to join the chat...if you have an idea of when that would start I'll try and sort it so I can attend, thanks. It looks like Sunday 12th is the best day for a ride, dinner and drinks. We'll meet mid-afternoon (time TBC) to enable those that want to do or help out at the Corrieri's Classic to do so and then come and do some proper biking. Followed by dinner, possibly at the Westerton but again TBC. And over dinner we will hatch some cunning plans for upcoming rides! If you didn't get an email from me about this then post up here if you'd like to come along. A few of us are hoping to meet up (possibly even going for a ride first!) for a drink and to do a bit of planning of club rides, maybe get some more dates in the diary. If you are interested in having a say in the future of mountain biking in the club (at least for the next few months!) please feel free to come along. I have set up a Doodle poll here: doodle.com/poll/fwdrepnasgz98f56 and anyone is welcome!